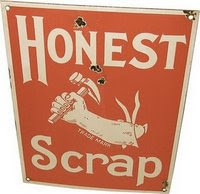 My Random Day who's badge appear below gave me my first award for 2009 - Honest Scrap Award. Thank you so much for appreciating my blog! Her page is filled with her random thoughts about politics, her family, and current events. I find them all pretty interesting. You may click the badge to visit her site. When accepting this auspicious award, you must write a post bragging about it, including the name of the misguided soul who thinks you deserve such acclaim, and link back to said person so everyone knows he or she is real. Choose a minimum of 7 blogs that you find brilliant in content or design. Or improvise by including bloggers who have no idea who you are because you don’t have 7 friends. Show the 7 random victims’ names and links and leave a harassing comment informing them that they were prized with “Honest Weblog.” Well, there’s no prize, but they can keep the nifty icon. List at least ten honest things about yourself. Then, pass it on! 1. I can't let the day end without a cup of coffee. I like it either Iced or hot! 2. I'm a frustrated rock star. 3. I love nature tripping. 4. I like watching movies a lot! 5. My mom once thought I'm a lesbian! Lol! 6. I don't like people who think they knew everything. They really annoy me! 7. I'm still waiting for love to come my way! hahaha! Hopeless romantic??? 8. I'm a fan of Charise Pempengco, Billy Crawford and David Cook. 10. I'm a spender. My mom keeps nagging me about it! She keeps on saying that I have to save for the future... blah! blah! I know she's right though! * Polly of Random Ramblings who has really unique and relaxing content on her blog. * Wind of Windmill on the hill who always amuses me with his brilliantness and funny-ness! Lol! * My cousin Ellaine's "Love blog" - Our Journey to Forever which will also inspire you to fall in love. * Suedonim of A Pilgrim's Journey who will also touch your heart. * Schizoshrink who posts her random thoughts and opinions. * Mizé of My Country Home who writes about her life in her beautiful country Portugal. * Gem of The Lady Programmer - a freelance tech who provides a lot of new info about technology and blogging per se. I still have to post some awards that Mathias gave me, but I´ll post yours right after.